TORONTO -- Canada's main stock index returned to its highest closing in nearly seven months on Monday as the price of oil surpassed US$59 per barrel for the first time since November. 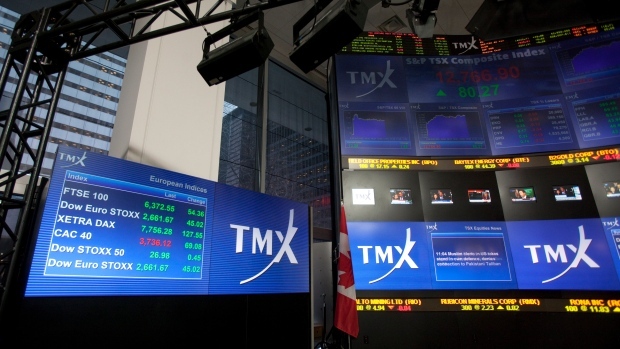 The S&P/TSX composite index closed up 111.02 points to 16,251.37. That's the highest level since last August and just 1.9 per cent off its all-time high set last July. The Toronto market has slowly been creeping up since a blockbuster first two months of the year that nearly recovered all losses from late last year. There's a chance the TSX will set a new record in the coming weeks but will likely consolidate just short of that high until spurred by another catalyst, says Mike Archibald, associate portfolio manager with AGF Investments Inc. He says the market has been fairly steady in March, rising 1.6 per cent so far in the month after gaining 12.5 per cent in January and February. The market was helped Monday by a 2.3 per cent hike in the health care sector as Green Organic Dutchman Holdings Ltd. and Hexo Corp. led the cannabis stocks. The key energy sector rose 1.9 per cent on the back of OPEC cancelling its April meeting, leaving oil supply cuts in place until at least June. The May crude contract for U.S. West Texas Intermediate crude was up 56 cents to US$59.38 per barrel. That's the highest price since Nov. 12. The energy sector was also helped by the April natural gas contract gaining 5.5 cents at US$2.85 per mmBTU. The financial sector was up 0.87 per cent as Manulife Financial Corp. rose 3.1 per cent after it announced that a Saskatchewan court ruled in its favour in its legal fight with hedge fund Mosten Investment LP over insurance contracts. Materials led on the downside as the price of gold dipped. The April gold contract was down US$1.40 at US$1,301.50 an ounce and the May copper contract was up 0.3 of a cent at US$2.91 a pound. The Canadian dollar traded at an average of 74.93 cents US compared with an average of 74.95 cents US on Friday. In New York, the Dow Jones industrial average was up 65.23 points at 25,914.10. The S&P 500 index was up 10.46 points at 2,832.94, while the Nasdaq composite was up 25.95 points at 7,714.48. The U.S. market saw Apple gain one cent to partially offset a more than 1.5 per cent drop by Boeing, which is facing global scrutiny following a deadly Ethiopian Airlines crash March 10 that killed 157 aboard the plane.